October 31, 2016 - Comfenergy was recognized as the most improved business at the 2016 Loudoun Dulles Green Business Challenge awards ceremony held at Catoctin Distillery on October 26, 2016. 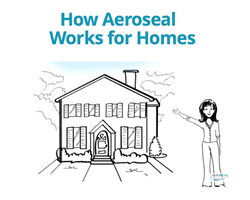 June 27, 2016 - Aeroseal is a fast and cost effective way to save energy in your home by reducing Duct Leakage. The new website at Aeroseal allows customers to calculate what that savings potential might be. Call Comfenergy if you would like to learn more about Aeroseal and other energy savings opportunities for your home or business. May 6, 2016 - "Falling Forward" is the topic on May 16th. Justin Dobson, co-owner of Comfenergy to speak in a Q&A panel about small business and falling forward. March 7, 2016 - March 4th, 2016 Barbara Comstock, Republican Member of US Congress from Virginia's 10th District visits Comfenergy in Sterling to show interest and learn what she could do to support this growing concern.